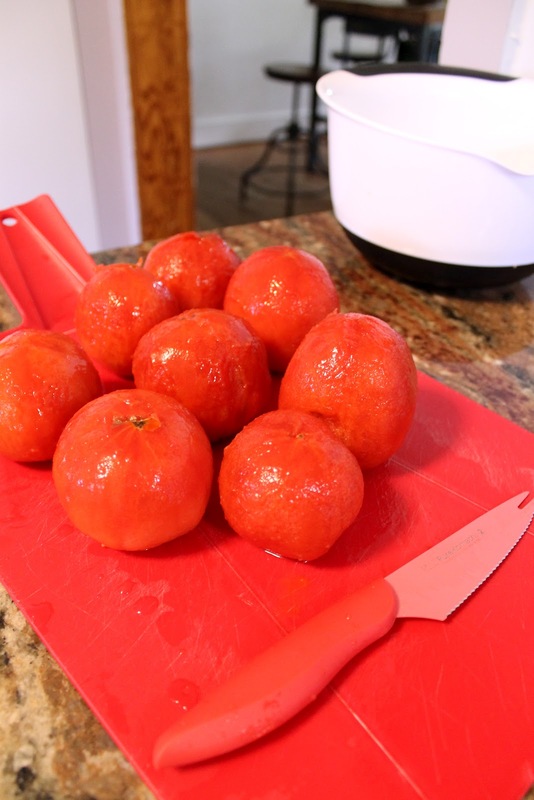 Have you ever tried to peel a raw tomato? Did it leave you feeling like the most frustrated person on the face of the planet? You are NOT alone. But there is a better way, friends. And if you didn't know about it, you are going to be so relieved. We canned a TON of tomatoes this summer, and this is always our first step. No matter is you are canning a bunch, like us, or just wanting to make your own sauce from freshies, this will be a helper in your tomato routine! Okay, no one laugh--okay, totally you can laugh--but I couldn't find a slotted spoon. So I had to use the closest thing I could find, which was this spaghetti thingy. Anyway, you put the tomato into the boiling water and let it go for a minute. The skin peels RIGHT OFF! I mean, the skin practically slides off! I did 8 tomatoes in no time at all!!! These suckers were recipe ready in 10 minutes flat!